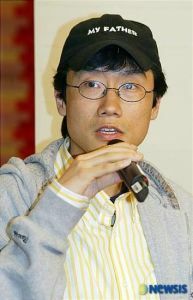 Hwang Dong-hyuk is a rising film director who is well-known for his previous works "My Father" and "Silenced". After studying for a M.F.A. in Film Production at the University of Southern California, his graduation thesis film Miracle Mile (2004)screened at over 40 international film festivals and won several awards, including the DGA Student Film Award and Student Emmy Award. His feature film debut was "My Father" (2007), and his second film "The Crucible" (2011) became one of the biggest stories in Korean cinema in 2011. The movie became a huge box-office hit attracting 4.7 million viewers.Hwang’s third film Miss Granny (2014) is his first comedy film. Unlike his past serious and heartbreaking movies like "My Father" and "The Crucible", Hwang is coming back with a wickedly funny comedy to show a different perspective as a dynamic movie director. Hwang stated that he is normally a funny person, which led him to direct a comedy movie. [Juts out on Blu-ray] Korean Movie "The Fortress"
[Upcoming Blu-ray Releases] Korean Movies "The Day After - 2017" and "The Fortress"